This site contains updated information about our shareware/freeware software. Shareware (free to try) - Mac OS X 10.9 - Fully compatible with MacOS Mojave. 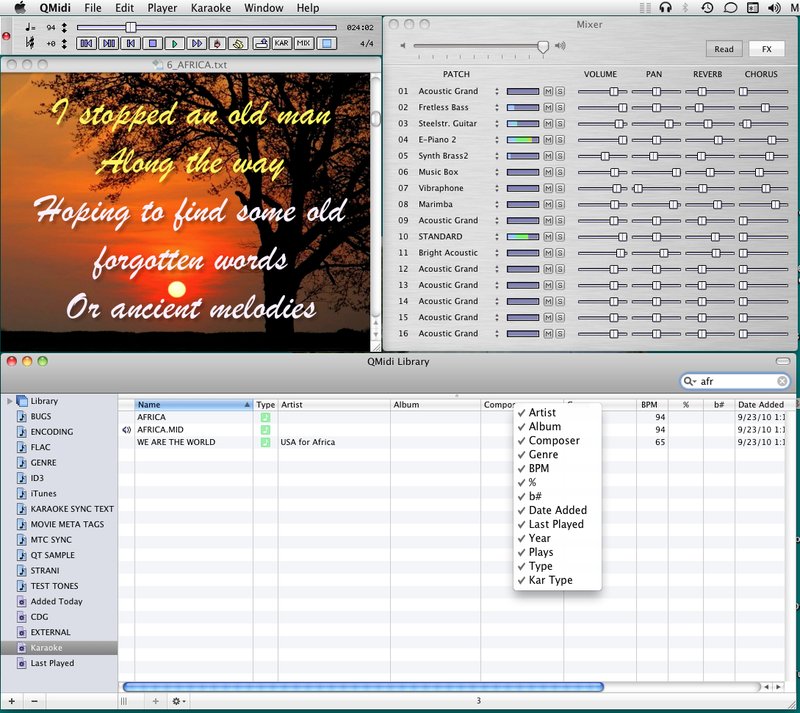 QMidi is the ultimate multimedia karaoke player for the Macintosh. It can organize and play many types of media files, including movies and .CDG files, and allows easy text and chords editing/synchronization. It features real time pitch shifting, time stretching and the ability to display karaoke and movie content in full screen mode, even on a second monitor. QMidi has an intuitive user interface, which you will be able to use immediately. You can quickly make playlists of your favorite songs and play them sequentially. You can also use the library to organize your files similarly to iTunes. Supports any audio/video format supported by MacOS Core Audio or AVFramework, MIDI formats 0 and 1. Plays MIDI karaoke, MP3 ID3 lyrics, .CDG files, movie karaoke. External text and chords display/edit/synchronization/merge. Multi-page PDF files display and synchronization. LRC and LRC+ file support and export. ChordPro file export. Text karaoke and CDG to movie conversion. Music library and playlist documents. 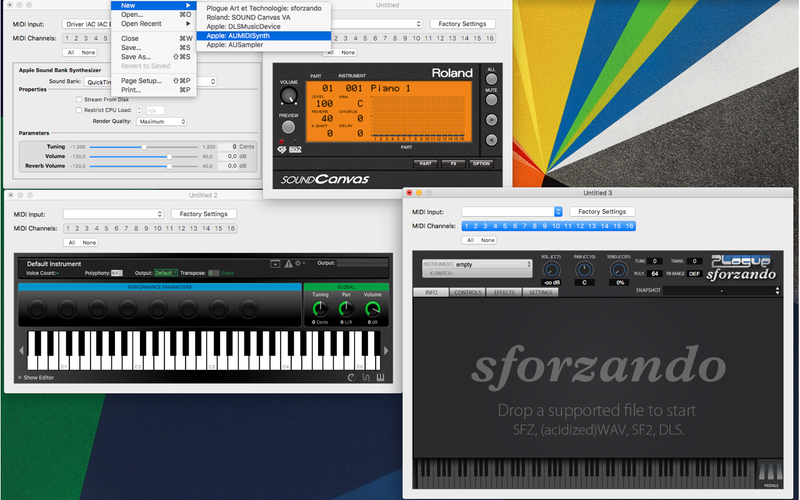 Supports MacOS Core MIDI devices and Apple DLS Music Device (SoundFonts). Play audio/video and MIDI in sync. See this feature in action. Crossfade your MIDI, audio and video files. Metronome with precount and user specified audio channel output. Ability to manually preload the next song. QMidi is a shareware product. This means, you may copy it freely and try it out thoroughly. As soon as you decide to use the program, you are requested to register it. Thanks for your support! Better pitch/stretch quality on video files. Manual sync mode: Enabled "Copy" menu, added "Paste Special" menu. Using separated undo stacks for lyrics and chords. Added an option in the missing file dialog to disable filename filtering. MP3 Export: you can now specify the SYLT header format on advanced settings. Added multichannel AIFF/WAV files support (Pro version). Fixed a crash occurring with malformed ID3 comment tags. Video not displayed properly on Mac OS 10.9 (Mavericks). Fixed. Fixed a crash occurring since version 2.8.1.1 on some Audio Interfaces. Since v2.8.1.1, video was not displayed properly on Mac OS 10.11 (El Capitan). Fixed. Fixed the document playlist 'wht?' error when playing next item (if not found). Fixed progress bar and time not updated on Mac OS 10.9 (Mavericks) when playing videos. Various enhancements, optimizations and bugs fixes. Important Notice for pre Mavericks system users: We will still support bugs fixes on 2.7.x 32bit version for a while. 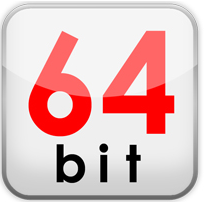 However we encourage everyone to update their QMidi and QMidi Pro applications to this rock solid 64bit release. MidiKit is a MIDI file browser/editor and batch processor. The browser quickly displays the most significant information about MIDI files. 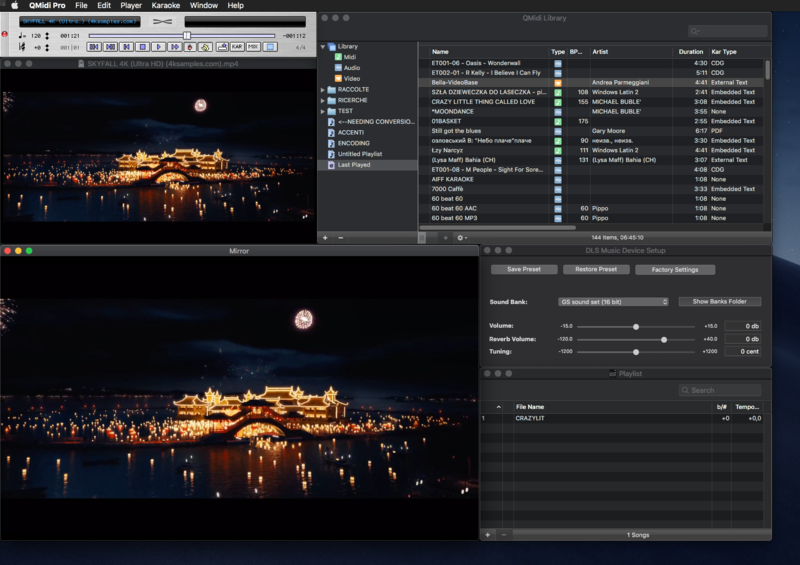 The editor allows native SMF editing with unlimited undo/redo capacity. 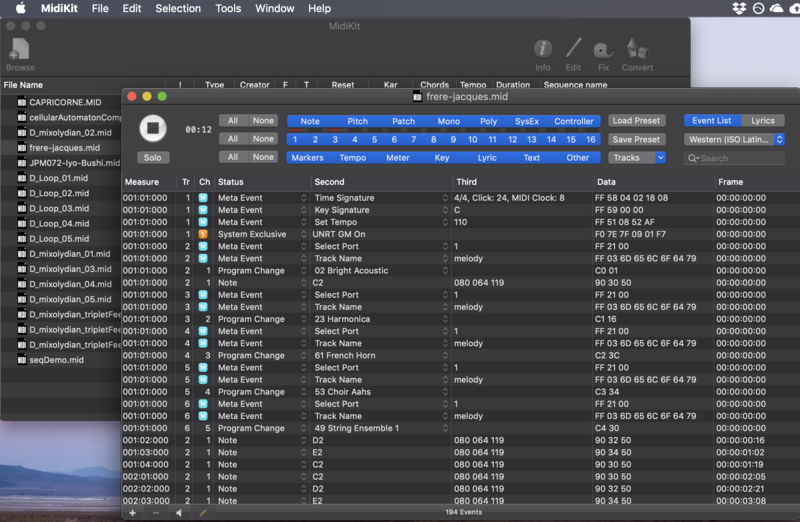 Finally, MidiKit allows you to apply several operations on your MIDI files by batch processing entire disks at a time! Unregistered version has no other limitations than the annoying request at startup. If you use it, please register! Mac OS 10.14 (Mojave) dark mode friendly. Now requires Mac OS 10.9 or later. Added solo button and channel meters on MIDI document. Added file duration on browser info. Added invalid delta time fix. Added missing sysex reset messages fix. Converting between 0 and 1 formats now produces cleaner files (garbage lyrics/chords events are properly removed). Corrupted files may be now better handled. Fixed bug on handling missing note off events. OS X v10.8 or later required. This application is a host for music devices audio units. Music devices are specialized OS X audio units that generate sounds in response to some control protocol (MIDI in our case), like virtual synthesizers. ITMTouchBridge is a touch screen driver for the Macintosh. It doesn't require an installer: just copy it inside your applications folder and run it. Choose "ITMTouchBridge Help" from the help menu for more details. ITMTouchBridge has been successfully tested with the Flatron L1730SF LG monitor running on OS X v10.4.11 and v10.5.6 and v10.6.2. It is currently compatible with the ITM touch screen USB controller used by LG and some other manufacturers. NB: This product is discontinued. MIDI Importer is a Spotlight metadata importer. Once installed, it will enable Spotlight to index and search the text (typically lyrics) embedded inside your MIDI files. 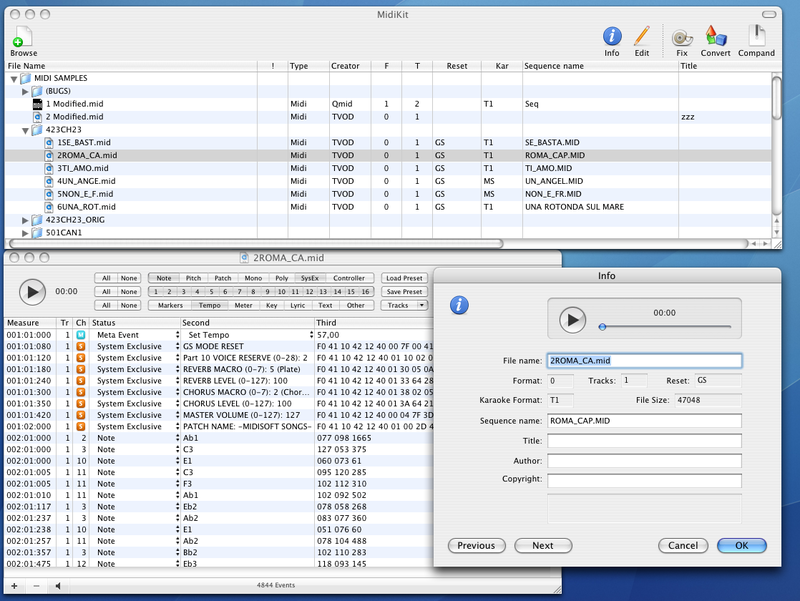 MIDI Import supports several lyrics formats, including M-Live lyrics, which are stored as System Exclusive messages. NB: Starting with Mac OS X 10.5, a MIDI importer is provided by Apple. If you are not concerned about Tiger compatibility and/or M-Live lyrics indexing, you don't need to install this software!